PARIS – As open mics in Paris fall to their deaths around us in droves – the Baroc, the Noctambules, the Escargot Underground – there are those that seem to be glued to the foundations of Paris like the catacombs. Last night I finally attended the Highlander open mic for the first time in as long as I can remember as a performer, although I had gone a week too early to what I thought was the ninth anniversary, a few months ago and did not stay long or play. But last night, as I waited my turn for a long time, I was at first discouraged and feeling despondent. But as the night went on, things got better and better, and I know why the Highlander has lasted so long…. Part of it is Thomas Brun, the MC who has run it from the beginning, and that is a very, very big part. Thomas is the epitome of an open mic MC, helping, kind, interested, and always ready to accompany musicians when they need him on guitar or other electronic device. He is also extremely fair in the allocation of the slots, always accommodating, and always keeping an eye on peoples’ needs. I did take a little walk outside at one point, as I was around 13 on the list, and I couldn’t wait eternally, having arrived at 20:05 and eventually playing at 23:30 or so – shows how popular this place is. And I took a stroll over to Shakespeare and Company bookstore before it closed and I had a little revelation. I picked up a number of the new novels on the tables of new novels by great and well known authors in huge publishing houses and I read their first lines, or first pages, and I said, “What has happened to literature today!?!?! ?” I mean, I was interested in none of these books. They looked like hell. They looked boring and heavy and … jesus, I thought, what’s going on? Is it me? Have I lost the taste for fiction?!? Then I strolled across the other side of the room and found some classic novels. I read the first line of a Jane Austen novel and I was so drawn in I had to read the rest of the page – despite having read the novel decades ago…. It was just BRILLIANT and competent from a writing point of view. Then I read the first sentence of a Hemingway novel… same thing! Brilliant. Makes you want to read on. Both were so perfectly things we can understand and relate to! So then I concluded that the shelves of today’s latest fiction are pure crap only because this year’s crop is pure crap. No other reason. So I returned to the open mic feeling fuller and nourished. And I awaited my turn, and I played “Come Pick Me Up,” by Ryan Adams, and I played Cat Stevens’ “Father and Son,” and I played my “Borderline.” It was fun as hell. And there were more and more amazing musicians. And in the end, I felt fulfilled. A great night at the Highlander, and elsewhere. I’ll be back. Oh, and I understood why the Highlander has lasted. It’s just for all the reasons I listed above…. I could not figure out which of the videos to put up first on this blog. But definitely check out the first two…. PARIS – As it turned out, I could have played in all of the three musical locations that I visited in Paris last night – but I played in none of them. And as it turned out, I was just as happy with that situation as going somewhere to play myself, as my real idea was to take in three in one night for a completely different cultural experience each time. The first was the one where, I will admit, the idea of playing there myself is greatly exaggerated. The only reason I mention it at all was that when I arrived at the Shakespeare and Company bookstore to hear Gary Lucas play his guitar and talk about and read from his book, Lucas actually had a guy singing with him in a vaguely Jeff Buckley manner. The guy, it turned out, was just someone Lucas did not know or had never heard sing, and he had asked in advance if he could join in and sing along when Lucas performed at the bookstore. Lucas agreed, and it was a cool effect and a nice little addition to a very cool presentation. So it occurred to me that perhaps if I had asked, too, he’d have given me a chance – even if it was a longshot…. 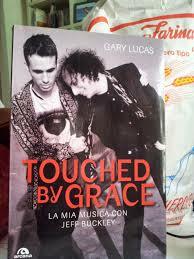 Gary Lucas was at Shakespeare and Company to promote his book “Touched by Grace,” which recounts his experience working with Jeff Buckley, with whom he wrote a dozen or more songs, including the famous “Grace,” and “Mojo Pin.” But Buckley is not his only claim to fame as a collaborator. Lucas has played guitar or otherwise collaborated with a Who’s Who of popular musical geniuses – to say nothing of Leonard Bernstein – from Captain Beefheart to Patti Smith to Lou Reed to Iggy Pop…oh and even people like Peter Stampfl, of the Holy Modal Rounders…. Lucas played his Gibson J-45 in opening tuning, filling the Shakespeare and Company bookstore and its full-house of people with the ethereal sounds that are his trademark. I bought one of his CDs, which I will be including in my next Morning Exercise Music review. Oh, and I must add that I was just delighted that although I arrived a little late, and the bookstore was entirely full to the point that the front door could not be opened, I was ushered up through the first floor library by another door into the building, and led down to the back of the “stage” to listen to Lucas. That, by the way, is why you only get my videos of Lucas from off to the side of the musician, and from behind. From Shakespeare and Company I headed over to the Tennessee Bar to check out the open mic. There, of course, I’d have been able to play if I wanted to. But I had that third date of the night coming up, so I just stayed and listened to a few songs – including by the mainstay of the Tireuse open mic, Wayne Standley – and also by someone else using a Gibson, similar to the J-45 of Lucas, but which was either a Dove or a Hummingbird, and they were also using it in a similar manner. But to slightly less effect. Still, it was an incredibly beautiful sounding guitar and nifty playing. Once I had assured myself that my favorite Thursday night was going strong, I finished my beer and went off to the third location. This final stop of the evening bore no resemblance to the first two. I was invited to this one by a Brazilian friend, who said that she had a Brazilian friend playing Brazilian music in this hotel – the Hotel Athenee. I was a little confused when I got there, as I had for mixed it up in my mind with the Plaza Athenee, or whatever it is. But this was quite a posh joint as it turned out, with a long lobby cocktail bar room in plush furniture and walls covered with casting photo portraits of famous Hollywood stars from the past. The Brazilian music was guitar and vocals, mostly bossa nova stuff, and it was a very cool and relaxed evening and foretaste of my imminent trip to Sao Paulo. My friend got up and did a song too, by the way, and she invited me to play, saying the mic was open…. So that’s how I tie in that final unforeseen possibility of being able to play in all three venues, had I wanted to. But there at the Athenee, I felt that the atmosphere was so laid-back Brazilian bossa nova style stuff that my own songs or covers would be far too big a contrast, although I was definitely tempted. In any case, it was a really cool evening, kind of like an all you can eat buffet of different foods and sauces, on the Paris plate…. PARIS – Ultimately, my Saturday in Paris yesterday was a very personal thing, but in another way, it belongs entirely on this blog as it started with some themes recently expressed here, and it ended with a surprise musical interlude of the kind I love. I was thinking of driving off to Deauville for the day, as there was sun and heat and it really isn’t that far. In then end, I decided to go to the Musée d’Orsay and profit by the sun and heat of Paris. But on the way there, I decided to go to the amazing crime writing library, the Bilipo that is behind the fire station on the rue du Cardinal Lemoine in the 5th Arrondissement that I wrote about on the blog the other day. I wanted to check out the mystery magazines and maybe see if there were any of the people I knew there. So I went to the Bilipo, thumbed the pages of the mystery magazines from England, France and the U.S. and then I spoke to Catherine Chauchard, the longtime director of the library. It turned out that we shared a passion for the band Moriarty, and ended up talking as much about music as crime literature. From there I went off towards the Seine and ended up stopping for a salad in the park of the St. Julien le Pauvre church next to the oldest tree in Paris, planted in 1602. This, of course, was right next to Shakespeare and Company, and I decided I must buy a copy of the New York Review of Books. So I went there and started entering this great bookshop only to find a hand and a voice preventing our passage: “Sorry, there is a line up of people here and you’ll have to wait in line before entering.” I turned to see this lineup of around 10 or so people, and I looked in the store to try to see what people were lining up for, and I couldn’t figure it out, so I asked. “There are currently too many people in the shop, so you have to wait in line until your turn,” was the response. Huh? I looked in the shop and found that it had fewer people in it than many times I had visited, and fewer than many stores. Clearly, though, the guy at the door did not seem to be wanting to get into a discussion of what this new policy was all about, and the last thing on earth I wanted to do was to wait in line as if I was visiting one of the seven wonders of the world, when in fact I had freely entered the bookshop for 30 years…. So I told the guy I wasn’t going to wait and I went off to the Abbey Bookshop, even if they don’t carry the New York Review of Books. Despite the even more cramped quarters of the Abbey, I’d never been told to wait in line…. So I went to the Abbey, which of course, I spoke about in two recent posts here. The place was buzzing along with business, and rather than being told to wait in a lineup to get into the mausoleum, Brian Spence, the owner, greeted us by saying immediately, “Oh, just in time for a cup of coffee with maple sirup!” So I had a cup of coffee with maple sirup and I explored the bookshop, descending into the cave which Brian referred to as the scene of the crime – in reference to my short story. And while I did not buy an NYRB at Shakespeare and Company, I did decide to ask Brian for some book recommendations, and I left with three (A Steinbeck, a Patrick Leigh Fermor and Paul Auster)…. Now does this not show how effective good customer treatment is in business?! I moved on to eat a meal at a Thailand restaurant, the Lao Lane Xang. The food was great. Oh, and on the way to the restaurant, I don’t want to forget to mention, I explored some wonderful parts of Paris, including the Chateau de la Reine Blanche, just off the Avenue des Gobelins…. What a city!! I decided to make a very brief visit to The Quiet Man pub since it reminded me of a similar kind of jam in Montreal that I had attended, the one at Grumpy’s. Whereas Grumpy’s is all about bluegrass, the Quiet Man is all about Irish music…played by French people. They all sit around a table in the basement room every Saturday evening and play jigs and reels, with violins, concertinas, guitars, flutes, etc. I stayed there for a half a pint of beer and then headed off to call it a night, oh, and perhaps catch some fireworks for a Bastille Day display, if there were to be any the night before the 14th…. On the walk away from there, however, I suddenly heard someone playing an acoustic guitar and singing, and I heard an accompanying violin, and I turned my head and looked right, into a pub called The Green Linnet. It was another Irish pub, and the man singing finished his song and saw me looking in and invited us in… I asked if it was an open mic, and he said, “No,” but the violinist indicated that maybe I wanted to play, and he asked, and as I was trying to figure out what to do, I noticed a man at the bar waving to me. 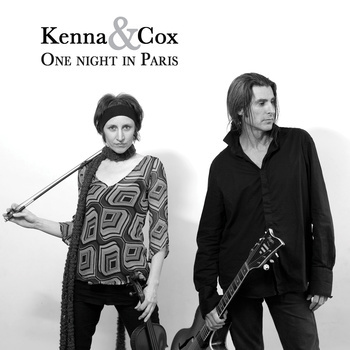 I suddenly realized that I had recognized the guy without it really clicking in my head: It was Chris Kenna, an amazing musician from Australia who lives in Paris and performs regularly in bars mostly in around the 11th Arrondissement. I had met him first when he was hosting an open mic in that area. Now he performs quite a bit with a violinist named Melissa Cox, as “Kenna and Cox,” and I suddenly realized this was the woman playing behind the mic with the other singer man (as I had in fact met her before too). So I stopped for a beer here, and they invited me to go up and play some songs after their break. So I played three songs: “Mad World,” “Borderline” and in order to suit the place, I sang “Raggle Taggle Gypsies,” which I rarely do anywhere. I was fantastically fun to have this impromptu, unexpected moment, and I had a nice conversation with Chris and Melissa. Then Chris and Melissa took to the stage and played a few songs, Chris with his deep, raspy voice that seems tailor-made for the blues, and a few other styles too…. They sounded great together. I left, and never did see any fireworks, but all in all, I realized, it was the ultimate day in the streets of Paris. How could it have been any better and with more unexpected moments and adventures!!! It felt like the greatest decision to wander about Paris rather than drive three hours to Deauville and three hours back, but I’d still have loved to stick my feet in the sea…. Oh, yes, and if you read this far, you might have also realized that I never did make it to the Musée d’Orsay, and in the end, that matters little. Perhaps all of life’s journey is kind of like this??? As it turned out, the Little Temple bar was NOT in the place of the Voice, as I mentioned, but slightly up the street and on the same side of the road. I had been invited by Jake Weinsoff, my friendly violin player with whom I played a couple of times in recent weeks. Jake has been hosting a musical evening at the Little Temple bar for a few months (it seems), and while it is not an open mic, Jake opens the mic and invites friends to play occasionally. So for me, it WAS an open mic. It was also something new! I have not been doing enough new things in Paris lately, so I was keen to try this. It was also “new” because Jake injects new life into the musical evening, and just about everything he plays. I came a little too late to see his singing set in the beginning, and by the time I left to go to an old open mic, he was about to go up again – but I had to move on. The Little Temple, by the way, is a very cozy Irish pub kind of place, with typical wooden walls, and all sorts of cubby holes and table and tall chairs all over. Very comfortable, and a fun night. But I had heard that the MC team is changing at the once-per-month Lizard Lounge open mic near the City Hall, and so I did not want to miss it yesterday just in case the thing no longer exists in another month. I was told I need not worry about that, as it turns out the bar owner really wants to keep the open mic running, and there may even be a chance it will run more often than just the first Sunday of the month. I got there a bit late, of course, last night, and so I only saw two or three acts. And I did my own songs. But I thoroughly enjoyed the evening, and was glad I didn’t miss it, and glad to get the news of what the future may hold…. Having recently discovered that the Shakespeare and Company bookstore has recently moved to a new address around the corner from its old one facing Notre Dame Cathedral, I also began thinking about that, of course, on this theme of new and old and changing of the guard, and in the context of the Village Voice. Life changes. In keeping with my promise to go out to as many “literary events” as I can, I went to a couple last night. There was a gathering at Shakespeare and Company to honor George Whitman, who died a year ago. And there was a little Christmas get together at the Abbey Bookshop, around the corner from Shakespeare and Company. The Abbey is run by Brian Spence, a Canadian whose bookstore on Harbord Street in Toronto I used to sometimes go to when I was at the University of Toronto. Shakespeare and Company, of course, I started going to shortly after that period, when George was already what seemed to me to be an “old man.” And he would go on to live another nearly 30 years. I made a little film of someone playing piano at Shakespeare and Company, but aside from that, it was really just a question of wandering around and paying respects, and perhaps having a bit of tea or some other drink, which I did not do. Then I went off to the Abbey and there an author was reading out in front of the shop, standing a crate like a speaker at Speaker’s Corner in London, with a large crowd of people standing in the cold beneath him. I think his book’s title has the word “merde” in it, and so I decided to go into the store away from the crowd, where I was warmly greeted – as usual – by the genial Brian Spence, who was preparing goodies for the Christmas toast to follow. I drank a deadly beverage offered by Brian who had received it from a client, and I read a few first pages of books to see if I wanted to buy any – the one I recall is Borges’ Labyrinths then an AJ Liebling book on boxing, but then the drink went to my head (it was from the Czech Republic or Poland or some equally strong, hardy nation) and I cannot remember the others – and decided I did not want to buy anything. I needed to eat something very quickly if I was to survive the rest of the night and a beer or two. So I went to a restaurant around the corner, ate some fromage de tête (head cheese), which was as disgusting as it sounds – were it not for the fact that it was excellent quality – and then a terrine de volaille and then ris de veau (sweetbreads, i.e. thymus glands), and some wine, and I was all ready to go off and have some Delerium beer and use up all that delirium and even the tremens, on an open mic. So I went to the open mic that I reported last week was a little like a literary salon, the one at the Arte Café. After all I had been through, I really did not expect the open mic to live up to my past experiences there, and I fully expected to stay a short time and leave. I thought I would stay long enough to drink the Delerium to digest the animal innards. But the open mic, once again, was really wonderful, and I enjoyed the music, enjoyed playing, and then enjoyed the jam session, and above all, meeting new and interesting people – as always at the Arte Cafe. Thanks again, Arte Cafe! It has been a very long time since I attended a literary event – if you exclude the literary events I partake of every time I read a work of literature, which is very often – and now that I am on vacation and staying at home in boring old Paris, I decided I would make an effort to attend as many literary events as possible. So it was that when I arrived at the Shakespeare and Company bookstore for the first of my planned literary events and I was being refused entrance by a young and somewhat helpless book worker, I was very upset. But the guy was kind of right to try: The bookstore was so full of people it was barely standing room only, with all corners of the shop being occupied by listeners for a panel of editors of literary reviews talking about the past, present and future of that genre. I think I will quit that theme now. From Shakespeare and Company I headed off to the Coolin that has a new system for the open mic that will be the death of it for me. It is an 8:30 PM sign up before the music starts at 9:30. This brings it to the level of the Highlander, where I can never get early enough to get my name on the list in a comfortable position – my fault, and the fault of living in the suburbs and eating a meal at home and getting up at 4 PM. But anyway…. So I went and signed up for the Coolin, then went to a great Italian restaurant next door and sat beside one of those women that you want to say to them: “You are the most beautiful woman in the world that I have ever seen.” But you don’t, because they’ve heard the line 500 times and no matter what, they will think you are insincere. And since it has happened to you 500 times you probably are insincere – except it seems true at that moment. But there she was with a friend, and talking about being friends with Vanessa Paradis and having approached “M” over some proposition or other…and slowly you think, maybe she IS the most beautiful woman in the world. Anyway…. Left the restaurant after eating one of the most beautiful pizzas in the world, went to Coolin, played two songs – Steve Forbert’s “Romeo’s Tune” (fitting, no?) and No Expectations of the Rolling Stones. Then realized that having signed up early enough to be around the sixth performer, I had the time to drop in briefly to the Tennessee for its open mic and then go to the Galway for its open mic. So went to the Tennessee, recorded a couple of acts, but did not even think of signing up to play at that late moment of the night, and then went to the Galway and played four songs. Grabbing hold of your own destiny. It feels great when you do it. Last night I went to the Highlander open mic and found it bursting with life, musicians and spectators. So much so that I was around 20th on the list of performers, and I wondered how I was going to make it from around 9:30 PM to 00:30 AM standing, listening, drinking, before I got up to express myself. After a beer, I decided that I knew no one with whom I wanted to have an extended conversation – despite some great friends present – as I was feeling a little low. I decided that my life is my own, and rather than standing there, I should go out into the evening and take a walk down the street to Shakespeare and Company bookstore to see if they had a recent issue of The New York Review of Books. I would freshen my spirt, and return to the open mic with a different mindset. So I went. A nice night, sun still, not dark. And when I arrived at Shakespeare and Company I still had an hour there before it closed. I found an issue of the 12 July to 15 August of the NYBR and then decided to look at the books. I found a few that intrigued me, but I bought none. I then heard some piano from the first floor, and applause. Hmm… Life music? I went upstairs and found the piano room in the library and there were a couple of teenagers, one with a violin and the other on the piano. They also had an electric guitar. There was a nice little audience of five or six people or more, of all ages. The musicians finished playing their song, saw my guitar and asked if I wanted to play. I sure did! So I did “Mad World,” and “Father and Son,” and the pianist and violin player joined me on the first, and the pianist tried to join me on the second too, but they were on the way out the door. It was a real pleasure to play in amongst the books at this monument of Paris bookstores where you are truly free to roam, read, play and whatever…. When I finished my song, a woman with her boyfriend or husband, said, “Do you play at the Highlander sometimes?” I said I did, and she said she recognized me from perhaps three months before. She and the man had only been to the Highlander once, but she had remembered me. Ouch! That was cool. And it showed what a small village Paris can be sometimes. Of course, it brightened my spirits massively, and I left Shakespeare and Company feeling as if I had been in control of my life and raising my downer spirit. I returned to the Highlander after barely an hour’s absence and walked in the door to order a beer, and a woman greeted me: “How are you?!? Long time no see. You cracking?” Or something like that. “Ready for some action?” she added. Well, I had to admit, “Yes.” I was ready. What was she proposing? Anyway, I spent the rest of the evening at the Highlander with her and a friend with her, whom I met and got on with like a highlander on fire. (sorry) I then performed my songs, and they liked it and the stuff went over well, despite me not doing only the usual stuff but trying something new. The only drawback to what turned out to be a fabulous evening all together, was that I only managed to make three videos of the great musicians present last night. My favorite of the three is the one of Thomas Brun going crazy on the final song of the night with all his electronic toys. It was very cool, and grabbed the spirit of the night.